Gionee S6 Pro has a unibody metal design and Fingerprint Scanner on Home button. Gionee S6 Pro feature a 5.5-inch Full HD (1920 x 1080 pixels) AMOLED display powered by a 1.8GHz MediaTek Helio P10 processor coupled with 4GB of RAM. On storage, smartphone has a 64GB of internal storage which is further expandable with MicroSD card. Gionee S6 Pro has a 13 MP rear camera with LED Flash and 8MP front facing camera. On connectivity device include 4G LTE / 3G HSPA+, WiFi 802.11 b/g/n, Bluetooth 4.0, GPS, USB Type-C .Dual SIM smartphone runs on Android (6.0) Marshmallow out of Box. Gionee S6 Pro is packed by a 3130 mAh Battery. 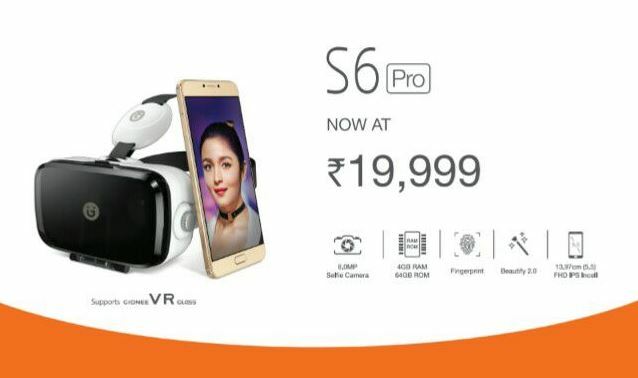 Gionee S6 Pro comes pre-loaded with Gionee VR app, which lets you enjoy VR games available in G-Store.Gionee S6 Pro comes in gold and rose gold hues.